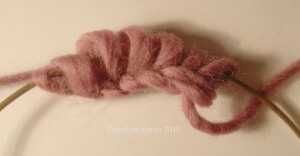 Magic Loop is a technique for knitting small diameter circles i.e. with a small number of cast-on stitches or when decreasing to an apex, while avoiding double-pointed needles (DPNs). It is very simple and effective, using only a few basic principles that are easily learnt. Slide stitches to halfway point of a set of circular needles, at least 80cm in length. 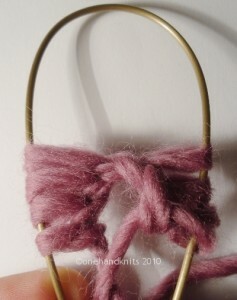 Split stitches in half pulling cable up through gap between the central two stitches e.g. 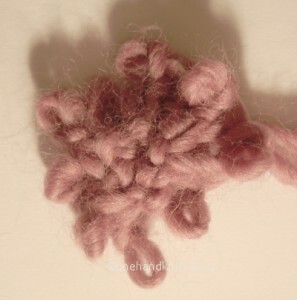 the 4th and 5th stitches in this case. 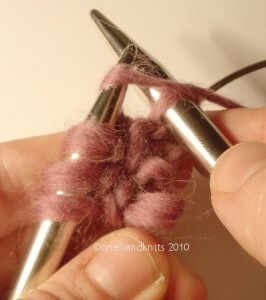 Making sure that there is no twist in your stitches, slide the first half (4) stitches back down onto their needle (needle B) and position the remaining 4 stitches so that they sit on the cable in opposition to those on needle B. Your right hand needle (needle A) should be free to move and use as if it were a separate single-point needle. 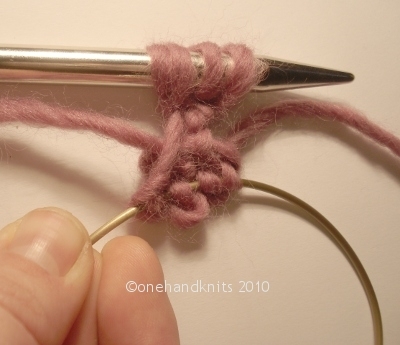 Keep the yarn tight as you join the loop by knitting through the first stitch on needle B (To ensure a really tight join, I cast-on one more stitch than is required by the pattern and slip this last extra stitch back on to needle B before pulling needle A through and then knit the last and first stitch together – K2tog). 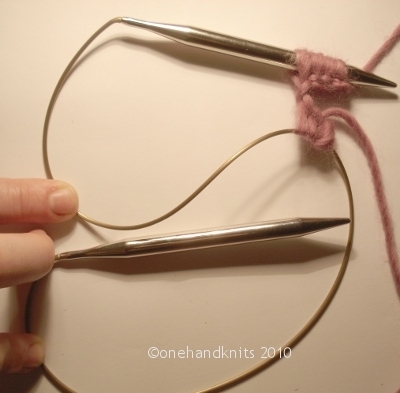 After knitting the first 4 stitches, pull the empty needle (B) back though the second group of 4 stitches so that they are lined up near the tip. Slide needle A free again so that the knit stitches lay parallel to the last 4 cast-on. 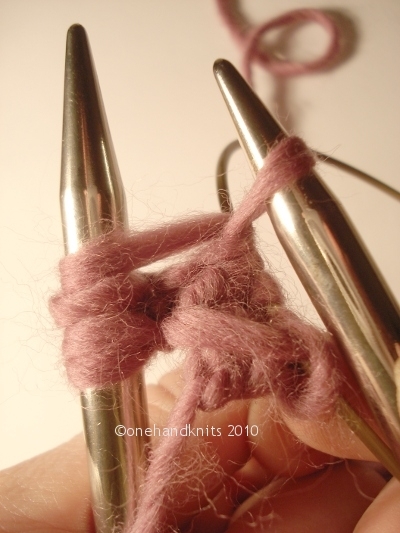 Again keeping the join tight, knit from needle B onto needle A. Continue sliding half the stitches at a time onto needle B and releasing needle A until the desired number of rounds have been completed. 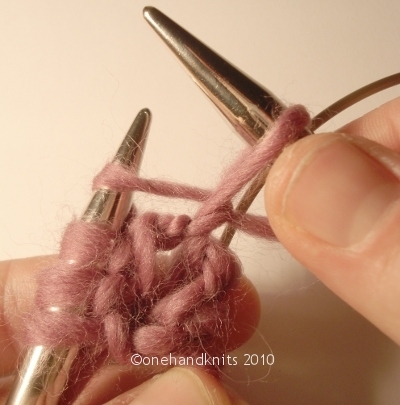 A marker between the last and first stitches is useful to ensure both sides are knit evenly. This entry was posted in Advanced, Knitting Tutorials and tagged adult, advanced, aran, argyle, autumn, black, blanket, blankets, blue, blue-faced leicester, bootees, brown, buy, cardigan, cardigans, cashmere, cast on, childrens, chunky, cicrcular needles, circulars, clothing, coat, coats, commission, cowl, crochet, design, designer, detailed, drape, dress, dresses, embellished, fairisle, fall, fashion, fine, fingerless gloves, floaty, gauntlets, gloves, green, grey, hat, hats, how to, independent, indigo, individual, instructor, intarsia, intermediate, intricate, jacket, jackets, jumper, jumpers, knit, knitting, knitwear, lace, ladies, learn, leggings, light, london, magic loop, mens, merino, mobius, mohair, not on the high street, orange, original, products, purchase, purple, red, scarf, scarves, shetland, silk, socks, spring, stranded, stylish, summer, superwash, sweater, sweaters, teach, teacher, teaching, technique, tutor, tutorial, uk, unique, warm, white, winter, womens, wool, wrist-warmers, yarn, yellow. Bookmark the permalink.